Sqrxz by Retroguru – Mindblasting frustration deluxe! – Hard, Harder, Sqrxz – Better play golf! Sqrxz (Remake) released sometime in 2010. Thor did some porting magic with his Playstation Vita. The first Retroguru game to hit the PSV is Sqrxz 4. Feedback is more than welcome! If you own one of these Mac OS X PPC’s… well… Sqrxz 3 can now run on it too! It’s an initial port for this architecture! Thanks Xavier! Need a new game for weekend? Sqrxz 3 hits the Nintendo 3DS. You’ll need a homebrew enable device to install and play this game. Thanks Gisberto aka nop90. Gisberto Rondinella cant stop porting, so we can proudly present a port of Sqrxz 2 for the Nintendo 3DS. Feedback can be either left here, via Facebook or via GBAtemp. With the help of Gisberto Rondinella we were able to start porting our games to Nintendo 3DS. The first Retroguru game to run on the Nintendo 3DS was Fruit’Y, which is now followed by Sqrxz 4, a horribly difficult Jump’n’Think game. This makes Sqrxz 4 available for more than 20 platforms! 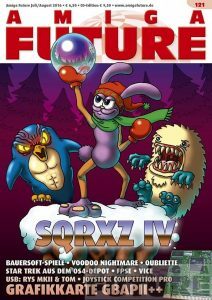 Sqrxz 4 v1.01 for Amiga OCS! In cooperation with Amiga Future you were already able to play Sqrxz 4 for Amiga OCS almost for a month. Now the game is also available for everyone else as a digital download, free of charge. Please keep in mind, the Sqrxz series is intended to be very difficult. If Sqrxz is not for you, we do have other games, which might be fitting the mainstream taste. Frank Wille did a perfect job on this re-coded game. It pushes the classic Amiga truly to it’s limits. The game runs as a whole with 50 frames per second. The great tunes by Alexander Wilkund and Johan Letfors will get tears in your eyes… and the bloody level design by Shahzad Sahaib will keep you busy for hours. Not to forget the great artwork by Simon Butler and Jan Jensen. Helping hand as usual Denny Müller. Simon is up to paid work at the moment… so if you need a great and reliable artist, you know to whom to talk to! We also plan a physical boxed edition, just as we did with Sqrxz 3. It will be on a pay what you want base, but minimum 8 EUR including shipping to Germany or Austria to cover our expenses. If you want to get us more than this, we also wont say no :) Please contact us, if we should put a copy for you on side. If you own one of these Mac OS X PPC’s… well… Sqrxz 2 can now run on it too! It’s an initial port for this architecture! Thanks Xavier! Thanks to Fabio, we now have Sqrxz 4 updated to v1.01 for Wii and GameCube!